Once you say the words, “I think we should invest in a video collaboration solution,” your IT team might look at you like you’re crazy—and that’s if you even have IT support in your business to begin with. Avoid that look altogether by letting video environment experts manage your video environment in the cloud. They actually love doing it. Traditionally, deploying video conferencing has meant a ton of work for the IT department, and in many cases, a dedicated resource to support the environment 24/7. Hardware or virtual machine software servers needed to be deployed, configured and managed within your existing infrastructure environment. With cloud video conferencing, all of that goes away. Because experts are managing your video environment in the cloud, very little is needed from your on-site support team. You can still have high quality video calls without all of the effort of managing a server-side video environment. View data and pull in-depth reports on statistics like user and room participation as well as call and device usage. Invite and manage users that will appear in your directory. Add and manage virtual meeting rooms where you can meet for scheduled and recurring meetings. 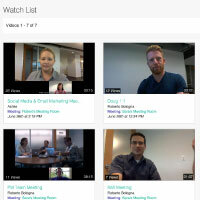 Access and share recorded meetings, subscribe to channels and bookmark videos to watch later. For more on stress-free video conferencing deployments, watch the on-demand webinar, Video Conferencing Made Easy. Register to watch now.